You can include your buyer's names when scheduling appointments or tours so that you can quickly locate those listings to review when needed. The second showing of a property in a different order than before can change opinions. And being able to connect all the listings with the buyers, can help you and your office discover trends that can lead to more sales. A new client contact can be added as easily as typing their first and last name, but we recommend that you enter the other details, to prevent confusion later. The email address, phone number, and any additional notes can be useful for future contact. 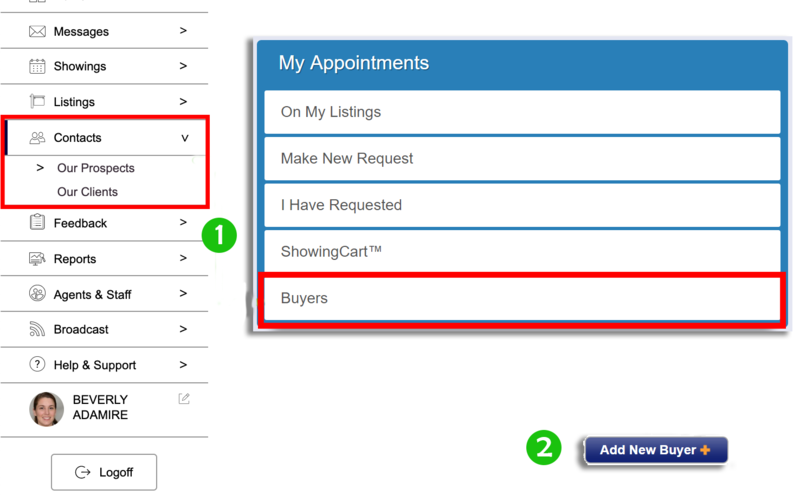 Buyers can be added to appointments, when using ShowingCart or when scheduling an appointment on the desktop or your mobile device. You’re in total control of your clients’ information. 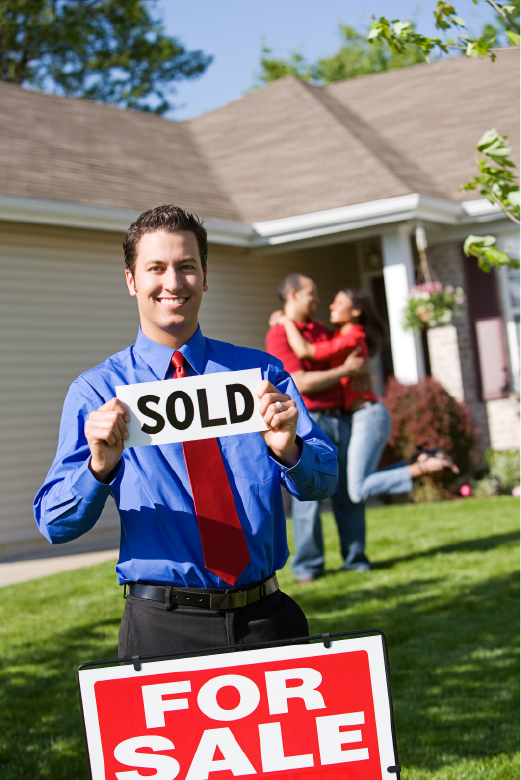 In some markets, you may see an option to share your buyer's name with the listing agent per appointment. In most markets it is optional and if you choose to do so only their name is shared. Their email and phone number are always private to you and your team. Locate the 'Buyers' or 'My Clients' section in your product. Click the Add New Buyer button. Add the buyers' first and last name. Once saved this information will be available for you to use on any of your devices while scheduling. You can choose from an existing buyer or add a new one when setting up a tour. Once you login to your Multiple Listing Service, and access ShowingTime, you can choose Showings from the menu on the left and then the ShowingCart option. Beneath the Tour Date field, you can select a buyer by clicking in the box, or add one by using the Add New button. The tour description will automatically become the buyer's name you entered or selected. You can also update this information. You can choose from an existing buyer or add a new one when scheduling an appointment. Once you access ShowingTime from your Multiple Listing Service, you can choose Showings from the menu on the left and the Make New Request option. After you have selected your listing you should enter the type of the appointment and the time you think the appointment will be over. You can then enter the name of your new buyer or choose from the list of buyers you have already entered. Note: The buyer’s details are only available to you as an agent. We do not share this information with anyone by default*. *In some markets you may have an option to elect to share the buyer's name with the listing office. Some markets may even require this information to be shared. On the go or in the office, an easy way to look up past showings when your buyer is in front of you can be helpful. Capturing those details also makes it easier to view future appointments related to them. From your phone or tablet, choose Clients then Add New from the menu. 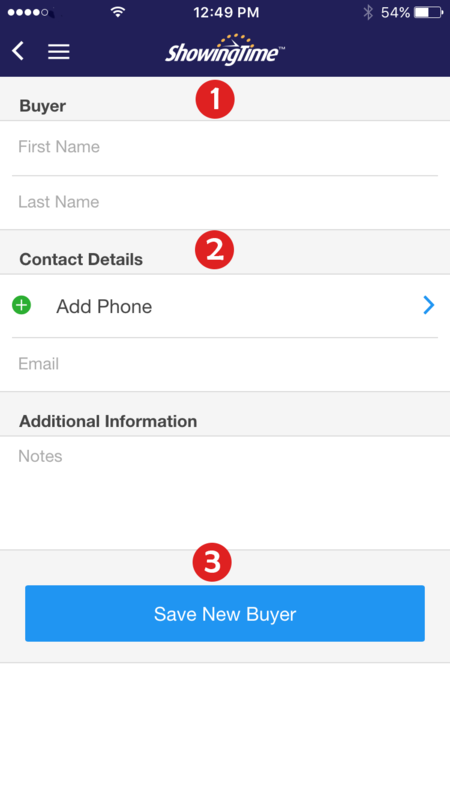 You can choose from an existing buyer or add a new one when scheduling an appointment from your device. 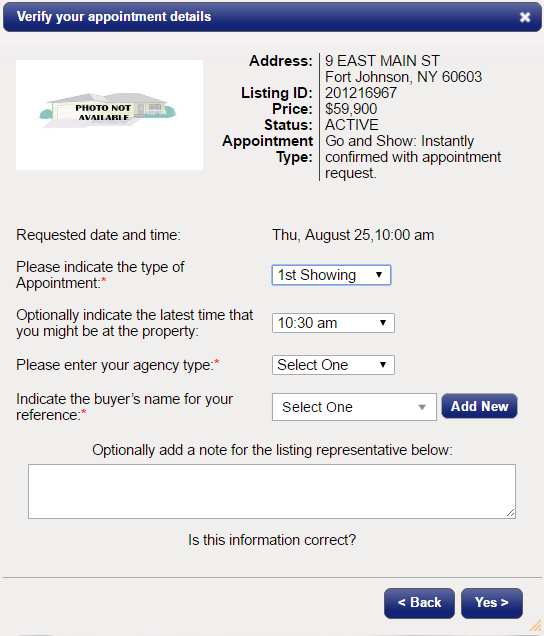 Search for the listing you want to show and choose the type of showing. Request your date, start time, and expected end time as normal. 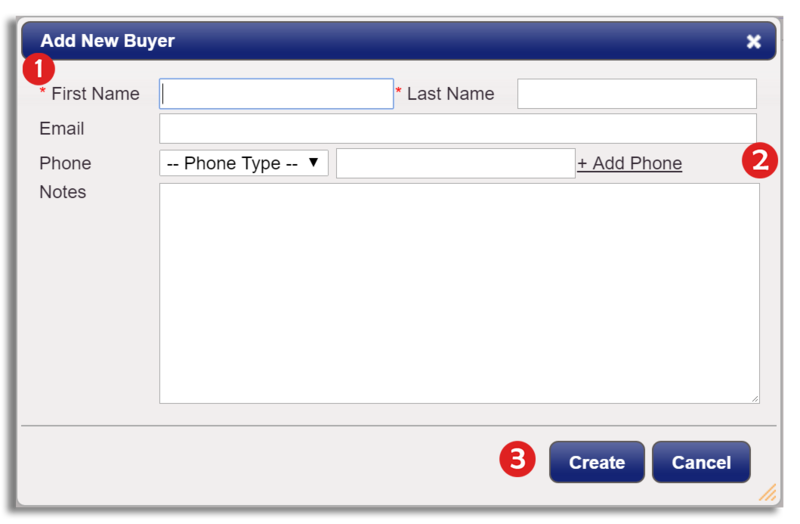 Then you can enter the name of the buyer or select the one you have already entered. Optionally, you can choose to share the buyer's name with the listing office or agent if that option is available in your market. Click here to see how to update and view your Buyer Activity.